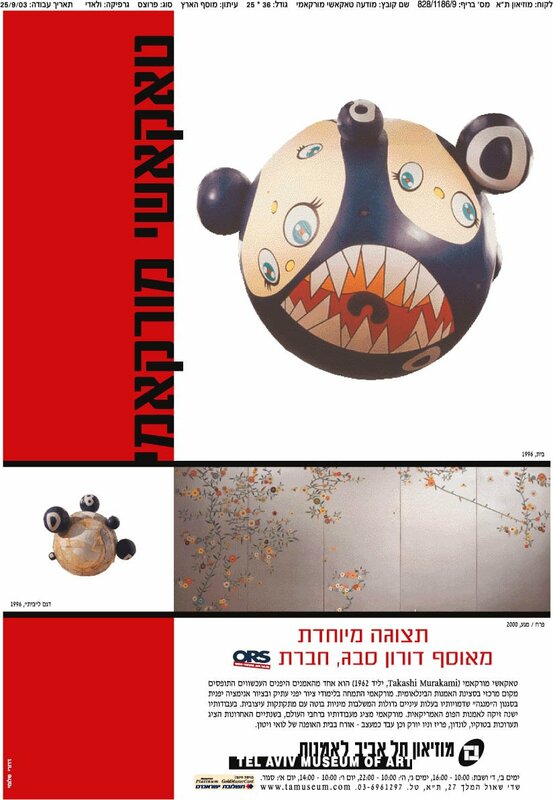 The exhibition “Takashi Murakami, Special Exhibition from the Doron Sebbag Art Collection, ORS Ltd.” at the Tel Aviv Museum of Art shed light on the distinctive artistic oeuvre of Takashi Murakami through his works from the Doron Sebbag Art Collection, ORS Ltd. Particularly, the works included in the exhibition were “Flower / Contact” and “House” are reflected on his unique use of color and a wide range of mediums, flat/glossy surfaces, and the incorporation of motifs from Japanese traditional and popular culture. The work “House” is in the shape of Mr. “DOB” whose figure was first designed by Murakami in 1992 but since reappeared in many forms and variations in his work. In this work, Murakami decided to paint the ears of his animated “self portrait” with the letters “D” and “B”, while the circular physical properties of the character and object represent the “O”. This preoccupation with text was inspired by the American artists Jenny Holzer and Barbara Kruger whose works he saw in exhibitions in Japan. Furthermore, the motive of the “eye” is based on the literary character Hyakume, or “One Hundred Eyes”, a ghost which appears in many of the stories by the Manga author, Shigeru Mizuki. In this sense, “House” is a quintessential representation of Murakami’s aesthetic and the concept of Mr. DOB as a detached signifier: a character constantly undergoing a series of metamorphoses and a symbol of all the other artificially assembled characters that retail merchandise. Takashi Murakami was born in 1962 in Tokyo, Japan. During his studies at the Tokyo National University of Fine Arts, Murakami specialized in the ancient traditional Japanese painting and in the Nihon-ga painting. Nihon-ga painting was developed in Japan in the last decade of the 19th Century in an attempt to preserve traditional painting methods while adapting new Western artistic techniques. Mastering these skills, Murakami was captured by the magic of Anime, the Japanese animation. He was particularly fascinated by the Otaku, one of the many movements of the rich and multi styled genre of Japanese comics. Otaku, which is based on the aesthetic values of the Manga, is an underground style that exists predominantly in computer networks and whose figures have big intoxicating eyes with blunt sexuality and saccharine designs. In the early 1990’s Murakami was exposed to a wave of Western art that swept Japan due to its economical success. Naturally Murakami became close to the popular culture and Western comics which were the core of American Pop Art aesthetics and of artists such as Andy Warhol and Roy Lichtenstein.